Through Nov. 8, bevello is celebrating the Movember movement for men’s health awareness. Make an in-store purchase at any of their 10 North Carolina locations (HQ’ed right here in Raleigh!) 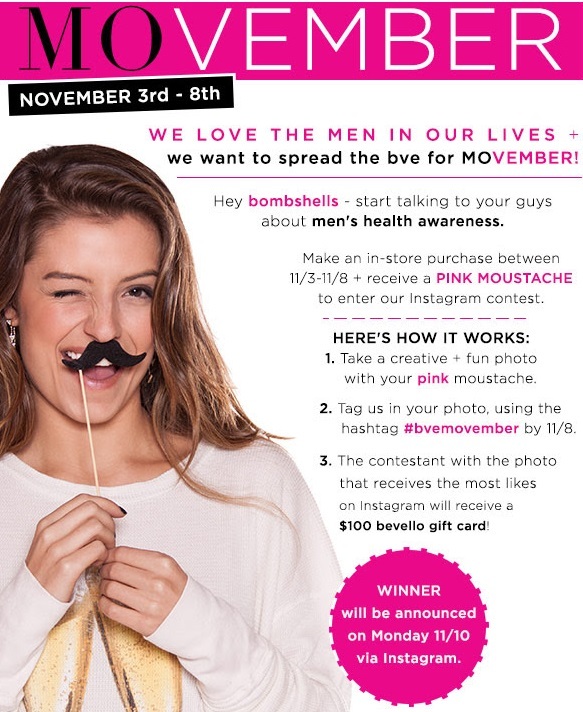 through Nov. 8 and receive a pink moustache to enter their Instagram contest. 1 – Take a fun photo! Bevello gets into the Movember spirit! The winner will be announced on Monday, Nov. 11 on Instagram. Good luck, shoppers. Show your guy that you care AND do a little shopping in the process.